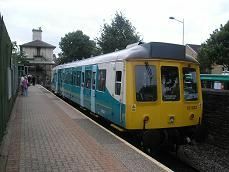 The train leaves platform 3 of Cardiff Queen Street station on a regular six minute shuttle service. The station has two other platforms on an island and is a very busy station with Valley Lines trains passing through here. The train I get is quite busy with many tourists and is over half full. We leave from Platform 3 which has its original canopy in place. It is a two minute turnaround for our train and it leaves on time, going due south. We pass lots of hotels and modern buildings on either side of us as we travel along an embankment. We pass over the line to Cardiff Central and then travel past a mixture of old and new buildings. We pass a large church on the right and then more new housing on the left and two high rise blocks of flats on the right. We then slow and come to a stop at Cardiff Bay station, which has just the one platform and a nice original station building of white stone. It's a newish looking platform, with the old original station wall on the left. The train waits here for just two minutes before returning to Cardiff Queen Street.